We started using Math-U-See several years ago when Morgan was having trouble with every other curriculum we tried. It worked for her, so I continued using it with my three youngest kids. Demme Learning has come out with Digital Packs to make accessing the videos and manipulatives easier than ever. 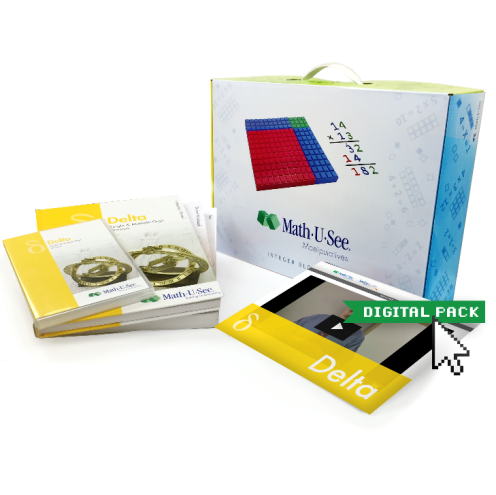 Alaina has been using Math-U-See Delta this year for school and for the last several weeks she has been using the Delta Digital Pack with it. Delta streaming instruction videos ~ The instruction videos are exactly the same thing you receive on the DVD. Instructions Manual PDFs ~ The lesson summary that is included in the physical instruction manual is available exactly as it looks in the book. Lesson & Test solutions~ The solutions and answers to the lessons and tests are here just like in the back of the physical teachers manual. Digital Manipulatives~ This is the same concept as the real blocks, but so much better. Downloadable Math-U-See Resources ~ In this section you can print record-keeping sheets, additional worksheets, graph papers, and access to the skip counting songs. Worksheet Generator~ Worksheets can be generated for each MUS level. Not only can you create a worksheet for each level, but you can select the starting level and ending level to cover on the worksheet. Online Drill~ Any fact family can be chosen for these drills. You can choose all the facts in addition, subtraction, multiplication, or division or you may choose only what your child is learning or reviewing. Record Keeping Sheet ~ This is same record keeping sheet that is included in the student workbook. You will need to purchase the student workbook and tests to fully use the Digital Packs. Delta covers division with multiple digits, roman numerals, expanded notation, large number place value, finding the area of a triangle, and more. You can view sample lesson and the table of contents to see everything that it covers. Alaina has been accessing the Digital Pack including the digital manipulatives on the iPad mini and the laptop. We found it way more convenient to use the iPad, so she could go anywhere in the house and not disrupt anyone else who is working on something else. She hasn't really needed to use the manipulatives in awhile, but she has been playing around with them on the iPad. There is a blank grid with blocks at the bottom and other controls at the top. The manipulatives can be switched from integer mode to decimal mode. The blocks are numbered and colored, and there are two ways to get the blocks onto the grid. You can either tap the one you want or touch and drop it there. Once they are in the grid you can move them around by touching and dragging them around. You can also use the blank area to write on. If you click on the pen and paper icon the blocks at the bottom will turn to a colored circle that you can chose one to write with. The blank grid can be changed to contain dots where the corners of each unit block should be, dotted red squares the size of the 100 red block, or a coordinate grid. We have used Math-U-See for a long time in our homeschool. We love the program and we love Mr. Demme. The Digital Packs have some great advantages. First of all I love not having to use the DVD. We only have one TV and DVD player in our house and it's in the room the girls do the majority of their seat work. It never fails that someone is ready to watch their math lesson when the other girls need help with something else and then there is just too much noise. The flexibility of taking the iPad in the other room makes it easy to view the lesson any where and any time. My girls get the manipulative part of this homeschool program and usually only have to actually use the blocks a couple of times while learning something new. It is much easier to pop the digital manipulative up and work with a few problems instead of getting out the entire box of blocks. I also love having access to the teachers manual and answer keys online. For the younger grades I don't utilize these as much as I do for the older grades. Guess what, if it doesn't get used every couple of days it usually becomes hard to find. I love having everything in the same place and accessible with just a touch of the finger. Alaina loves the flexibility of it & is happy to move to the other room and lay on the couch to watch her streaming instruction video.